A photograph of what remains of Czechów Wiatrak as seen as from the ancient access track up to the mill. Czechów Wiatrak is the ruined remains of a mid nineteenth century tower mill located on a hill just off the road between the villages of Czechów (former: Zechow) and Santok (former: Zantoch), near Gorzów, in Lubuskie, western Poland. Another view of the exterior of the tower mill near Czeckow (German: Zechow), in western Poland. This Dutch-style tower mill consisted of three floors and had three entrance doors. It was most likely built sometime in the 1840s and probably went out of use immediately after the end of the Second World War, when this part of what was then Germany became part of Poland. A ground floor view of the interior of the windmill on a hill overlooking the beautiful Warta (Warthe) River. 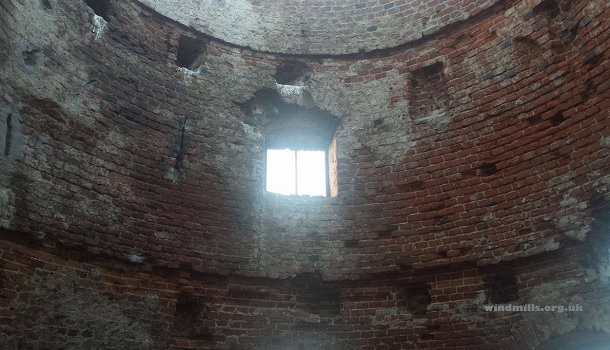 The beamed ceilings and floors, roof, interior workings, and sails of the windmill have long since disappeared and all that now remains is the brick-built tower, which stands at approximately nine metres high. During the communist period and after the interior walls were used by mountaineers in preparation for climbs in the Alps and Himalayas. A photograph of the interior of the mill showing where the first and second floors would have been. All photographs by and copyright of Ania Ratajczak for windmills dot org dot uk. A pre-war photograph of the windmill (wiatrak) just outside the village of Czechów (Zechow) in Lubuskie, Poland. This entry was posted in Windmills and tagged Czechów, Poland, Santok, Wiatrak on April 2, 2017 by windymiller. 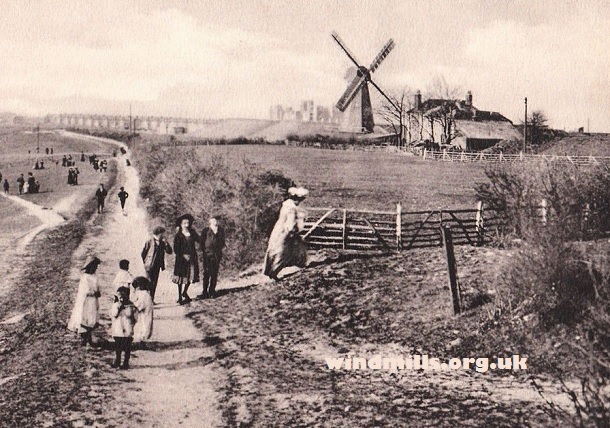 Detail from an old postcard featuring Darland Banks Windmill in Gillingham, Kent,c. 1905. 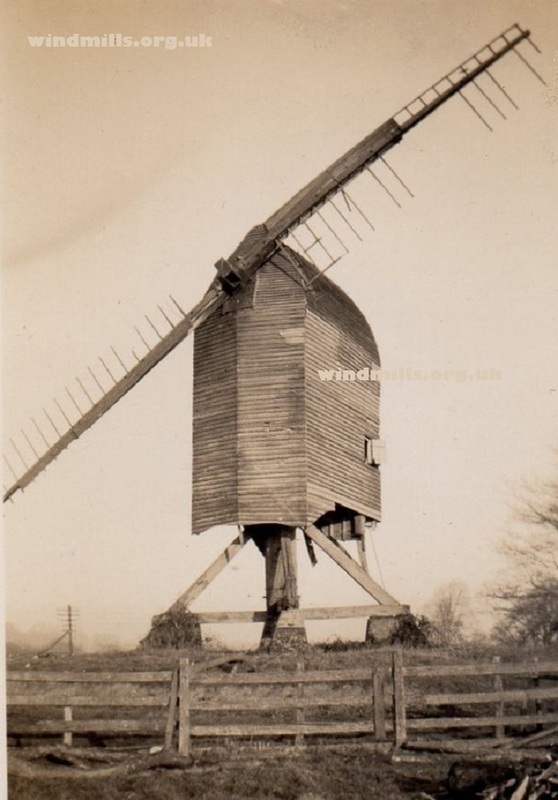 Star Windmill, as it was known locally, was a wooden smock mill built on a single story brick base. It was located in Darland Banks, near Gillingham, Kent, England. The mill dated to around 1820 and milled corn right up until the late 1910s to provide flour for the nearby army garrison. It was demolished in 1925. No trace of the mill can now be seen at the location. 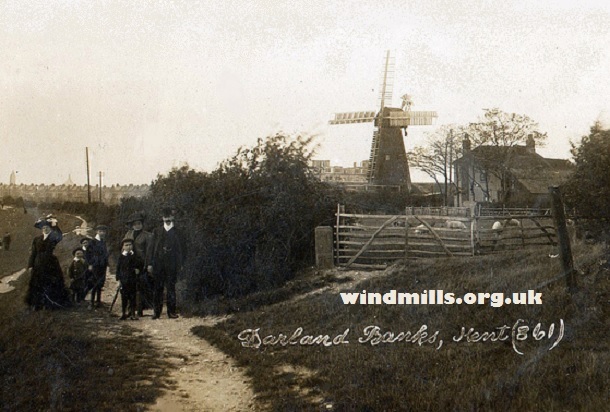 An early postcard of Star Windmill in Darland Banks, Kent, c.1905. Over time Star Mill was also known by various other names. These included: Darland Mill, Upper Chatham Mill and Austin’s Mill. 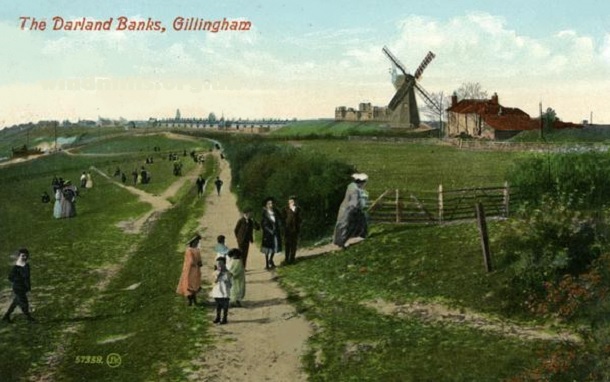 The smock mill in Darland Banks, between Chatham and Gillingham in Kent, on a picture postcard posted in 1907. 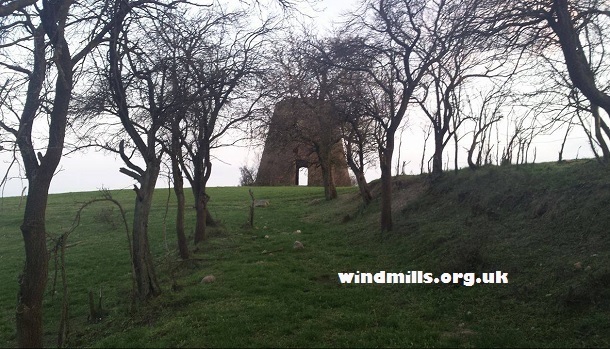 This entry was posted in Old Images, Windmills and tagged Darland Banks, Darland Banks Windmill, Kent on March 11, 2017 by windymiller. 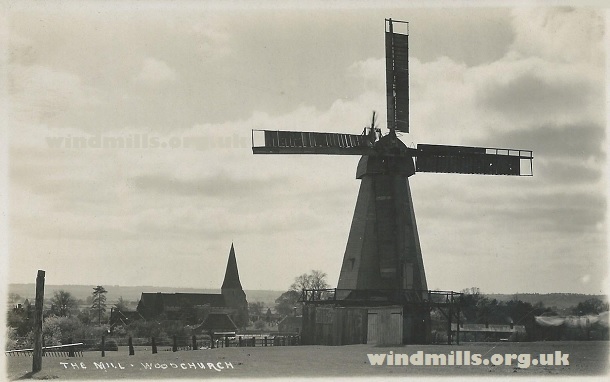 A vintage picture postcard of the smock mill in Woodchurch, Kent, c.1925. 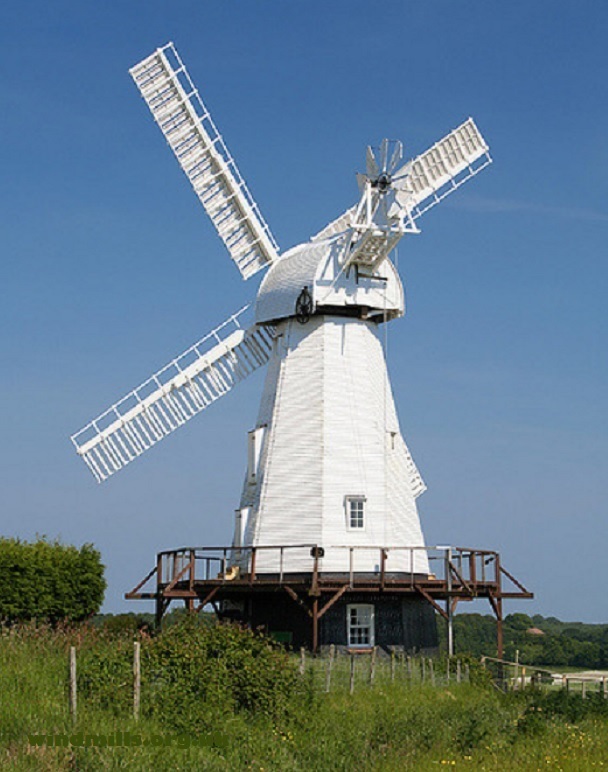 Although, a mill stood at least from at least 1729, the smock mill, we can see in Woodchurch, near Ashford, in Kent, south-east England is believed to date back to the early ninetenth century. Indeed up until 1940 there were two mills on the site and these twin mills were known as the black (or upper) mill and the white (or lower) mill. The white mill that still exists to this day continued to grind corn commercially up until 1926 and over a great many years has been restored to near working condition. 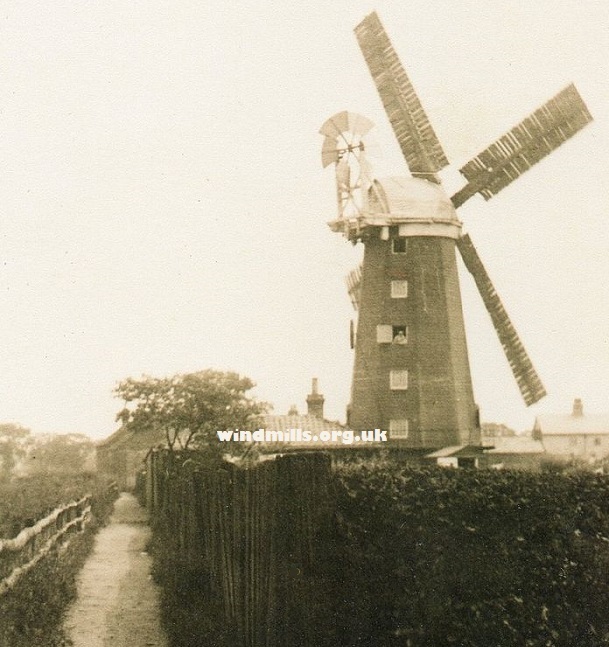 Woodchurch Mill is an eight-sided, four-storey smock mill built on a single-storey brick base. It has a Kentish-style cap and is winded by a fantail. The mill once drove three pairs of millstones and was used for grinding corn. 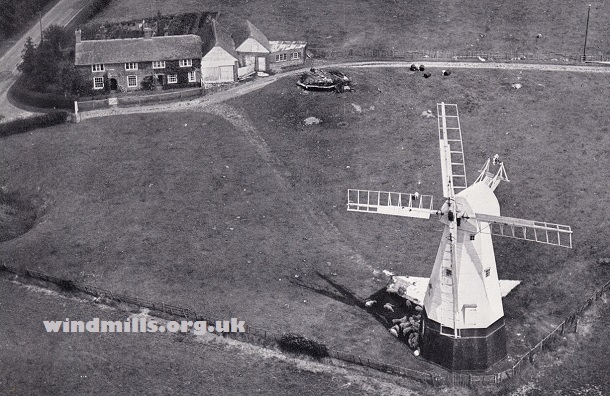 An aerial photograph of Woodchurch smock mill in 1952. The mill is now owned by Ashford Borough Council and is currently open on Sundays and Bank Holidays between Easter and the end of September, from 2pm to 5pm. The white smock mill in Woodchurch in its fully restored state. One source dates this mill to 1820. This entry was posted in Old Images, Windmills and tagged Kent, Smock Mill, windmill, Woodchurch on February 17, 2017 by windymiller. 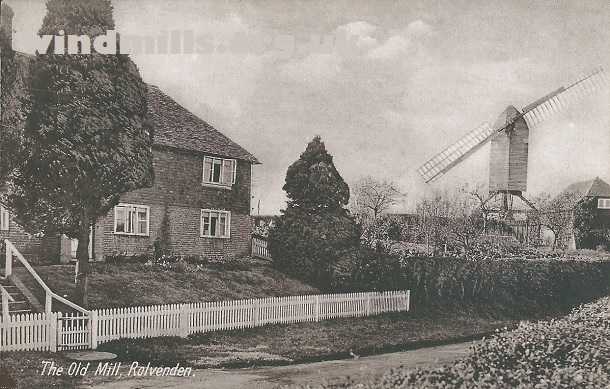 An old picture postcard of the Old Mill, granary buildings, and council housing, at Rolvenden, c.1918. 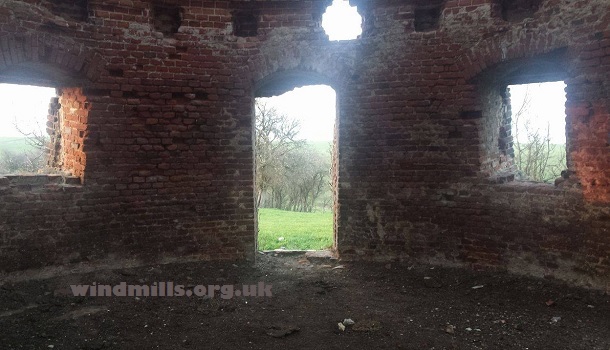 Rolvenden Mill is a post mill built on a single storey brick roundhouse. 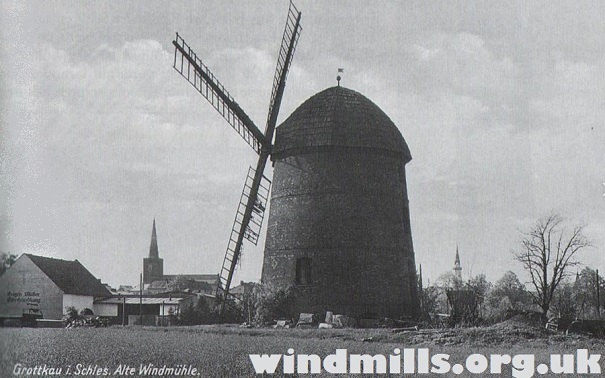 A windmill is believed have stood on this spot from at least 1596 but the current mill probably dates back to 1772. It probably went out of commercial use in the last decade of the nineteenth century. Following an extended period of disuse and the mill falling into disrepair it was fully restored in 1955. 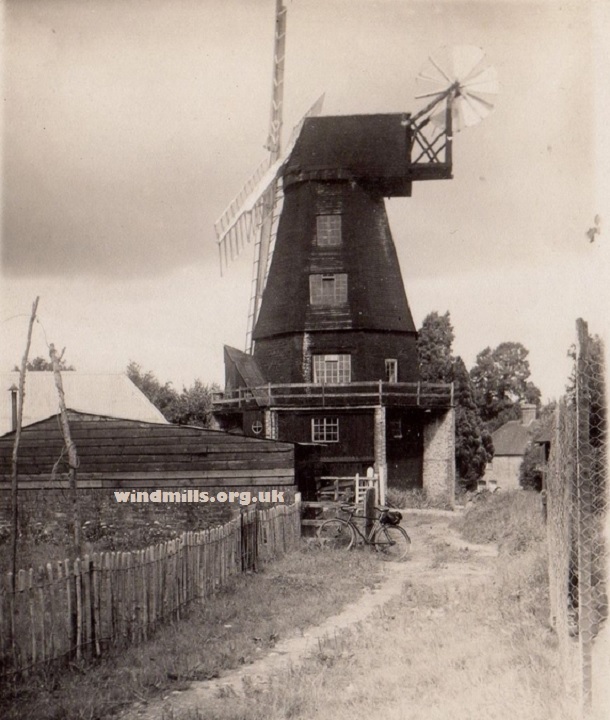 An old archive photograph of Rolvenden windmill in Kent as it looked in the late 1910s. The mill now has two pairs of millstones, in a head and tail arrangement. It is Grade II listed. A recent photograph of Rolvenden Windmill in Kent. Also visible is the former granary, now a house. This entry was posted in Old Images, Windmills and tagged Kent, Rolvenden, Rolvenden Windmill on January 12, 2017 by windymiller. 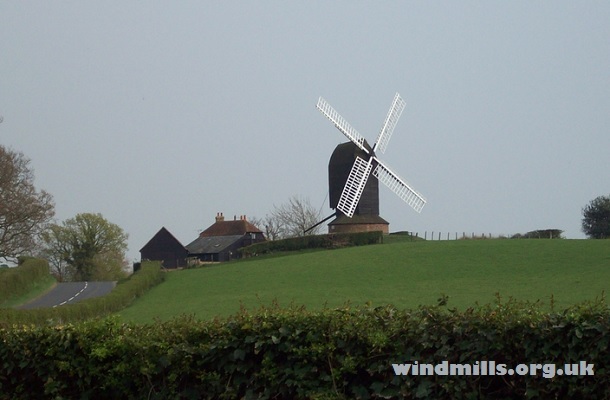 Meeten’s Mill as it is known locally is an eighteenth century eight-sided smock mill with a boat-shaped cap. It is thought to date to 1840 and using three pairs of millstones originally milled corn for local farmers. The mill was working until 1922, when it was stripped of machinery and converted into a house. It is located in the village of West Chiltington in West Sussex. England. 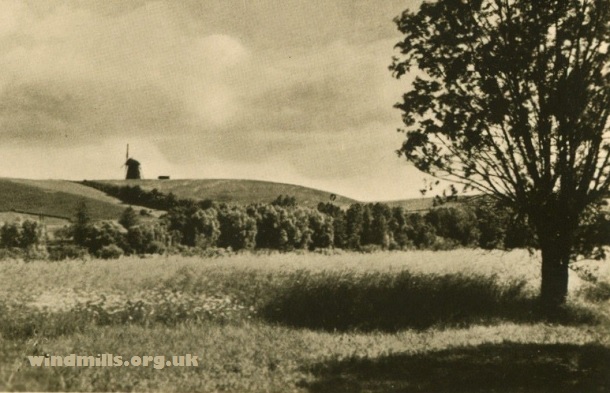 A photograph of the smock mill in Chiltington, near Horsham in Sussex, southeast England in the 1920s. This entry was posted in Old Images, Windmills and tagged Chiltington, Smock Mill, windmill on January 7, 2017 by windymiller. 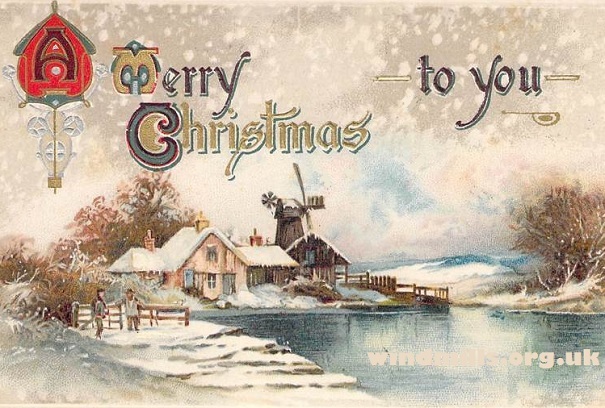 An Edwardian era Christmas card featuring a windmill and winter scene. Printed in Germany. We at windmills dot org dot uk would like to wish all our visitors a very Merry Christmas! This entry was posted in Windmills and tagged Happy Christmas, Merry Christmas on December 17, 2016 by windymiller. 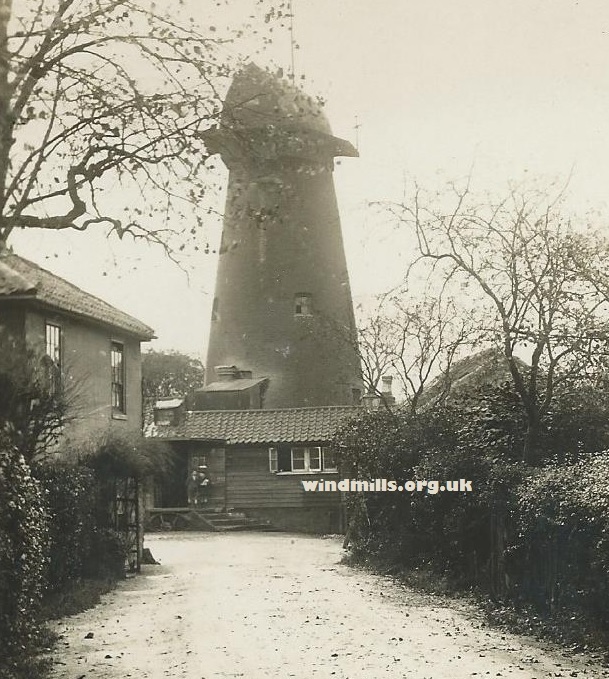 An early photograph of Wangford Windmill close to the Suffolk coast as it looked in around 1910. The six story smock windmill in Wangford, near Southwold, Suffolk, was built in 1883. It stood at a height of more than 21 metres and had four 8 metre sweeps. It was owned by the Earl of Stradbroke and worked for many years by a family named Martin. It was powered in its later years by both wind and steam and in commercial use right up until it burnt down in August 1928. Unfortunately, nothing of the mill survives. 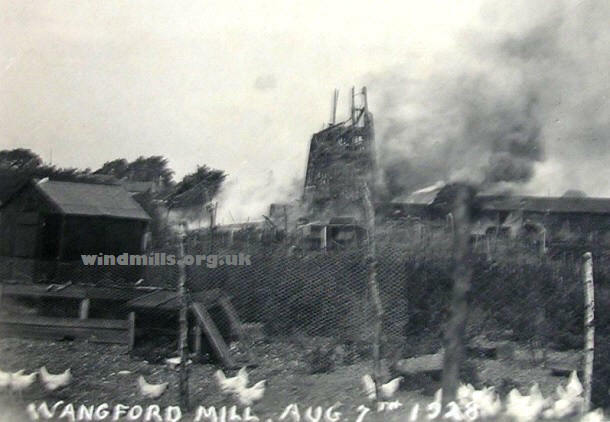 An old picture postcard recording the fire at the smock mill in Wangford on the 7th August 1928. In addition to the tower mill a post mill, built in 1801, also played an active role in the economy of the village of Wangford. This was damaged in a storm and dismantled in 1901. If you know anything more about either the post mill or tower mill in Wangford or have additional images do get in contact. This entry was posted in Old Images, Windmills and tagged Smock Mill, Suffolk, Wangford on November 5, 2016 by windymiller. A photograph of Ashby’s Mill in Brixton, south-west London, c.1929. 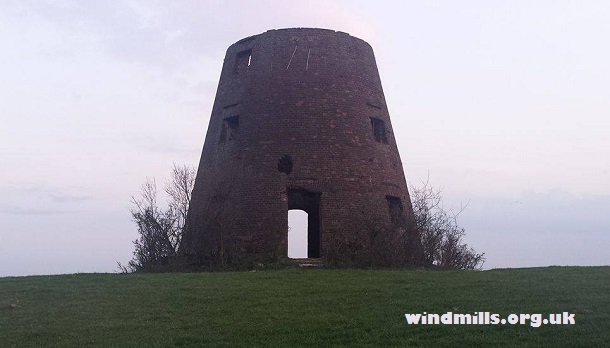 Brixton Windmill is a four storey brick tower mill with a boat shaped cap. It was built in 1816 and worked by wind up until 1862. Soon after the sails were removed and it was used as a store for a number of years. In 1902 it was converted to steam power and began milling flour again. It continued to do so right up until 1934. There then followed a long period of neglect. 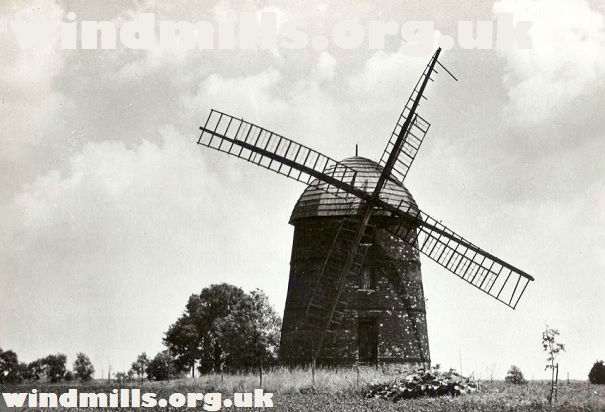 However, the mill was restored by with the help of a grant from the Heritage Lottery Fund and with funding by Lambeth Council and the Friends of Windmill Gardens at a cost of more than £600,000 in 2011. It has recently returned to full working order grinding both wheat and barley. Should you want to have a look at the mill yourself the address is: Windmill Gardens, West end of Blenheim Gardens, Off Brixton Hill, London, SW2 5EU. The Windmill is open to the public only on selected days throughout the year, so check first if you want to see inside the mill. Further details can be found at: brixtonwindmill .org.uk. This entry was posted in Old Images, Windmills and tagged Brixton, Brixton Mill, London, windmill on October 18, 2016 by windymiller. 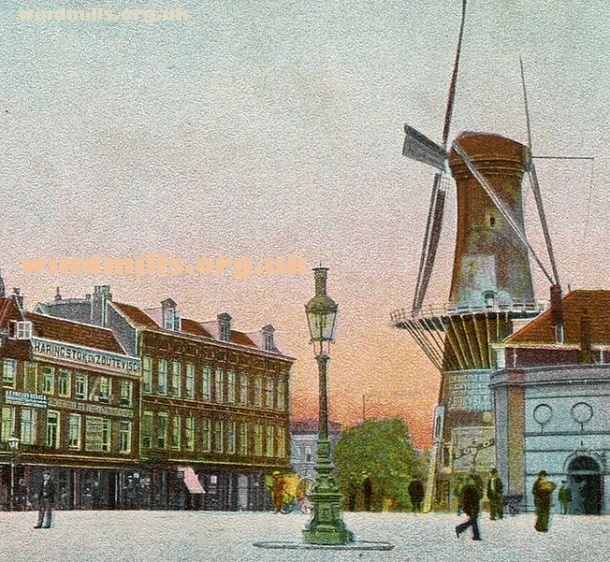 An old image of the windmill on Oostplein in Rotterdam, Holland, c.1905. Two old images of the De Noord windmill in Oostplein in the centre of Rotterdam in the Netherlands. 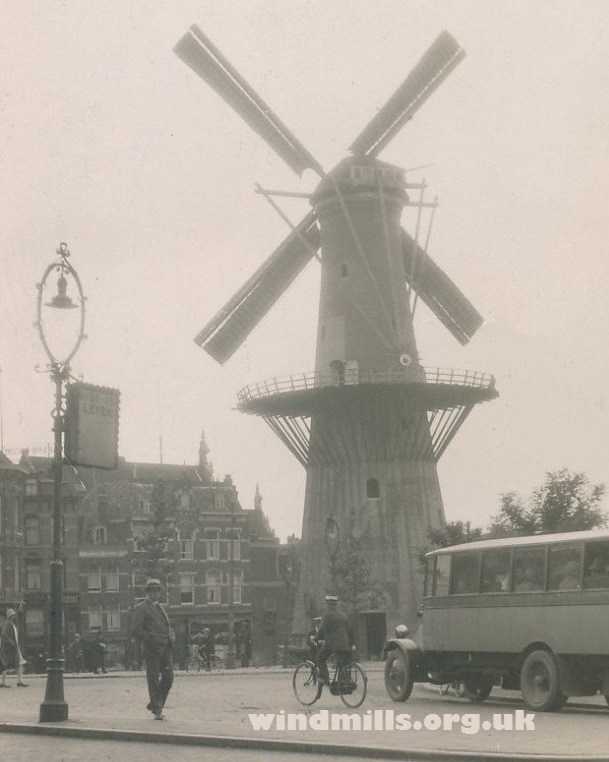 A photograph by the French photographer Delius of the windmill in central Rotterdam, c.1920. The ‘De Noord’ mill was of the ‘Stellingmolen’ type and built in 1711. It stood at a height of more than 16 metres and was originally used for grinding malt. In the late 19th century it was used to mill grain for cattle feed, which continued until around 1917 when it went out of use. The mill survived the German bombing of this part of Rotterdam only to be burned down in a fire on the night of 27th July 1954. In recent years there has been talk of rebuilding the mill but nothing has come of this to date. Stellingmolen are high windmills with a gallery. They were commonly built in urban areas in continental Europe. The design served two main purposes. It allowed the mill to capture enough wind and kept the sails and tail well above ground level. This, of course, largely eliminated the dangers associated with rotating blades. This entry was posted in Old Images, Windmills and tagged holland, Netherlands, Rotterdam, windmill on September 5, 2016 by windymiller. A photograph of the windmill in Grottkau, now Grodkow, Upper Silesia, Poland, c.1925. Two old images of the early eighteenth century windmill in Grodków, Silesia, in the southwest of Poland. The mill is of the ‘Dutch-type’ and went out of use just after the end of the First World War. It was restored in 1958 and then again in the 1970s and converted into a cafe restaurant. Due to safety reasons the sails were removed in the late 1980s but should you wish to visit today while admiring the mill you’ll discover that all manner of Polish cuisine and a selection of beers can be sampled at very reasonable prices. The mill in Grottkau / Grodkow, Silesia, Poland, as it looked in the 1930s. This entry was posted in Old Images, Windmills and tagged Grodkow, mill, Poland on August 12, 2016 by windymiller.